(Kitco News) – Global stock markets were narrowly mixed overnight. European stock markets were mostly firmer as Italian financial stocks posted a recovery from recent losses. Asian stocks were mixed, with buying interest limited by lower raw commodity market prices Tuesday. U.S. stock indexes are pointed toward slightly higher openings when the New York day session begins. 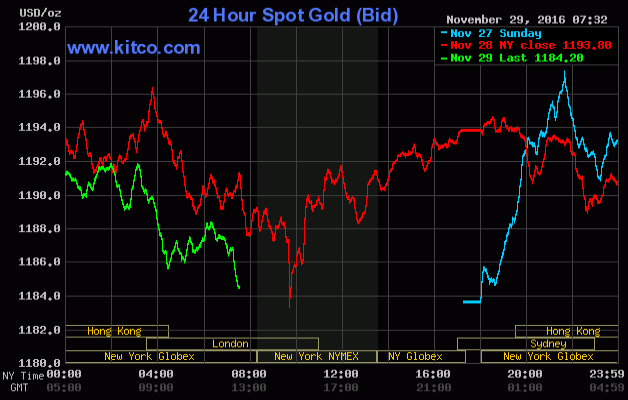 Gold prices are moderately lower in early U.S. trading Tuesday. 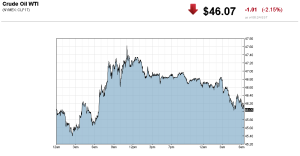 Bears remain in firm near-term technical control of both gold and silver markets. Traders and investors worldwide are anxiously awaiting the marketplace highlight of the week: the OPEC oil cartel meeting on Wednesday. A preliminary meeting Monday saw no agreement on a plan to cut the cartel's oil output, and that's pressuring crude oil prices Tuesday. Recent reports said Iran and Russia may not be willing to reduce their crude oil production levels. Saudi Arabia is insisting Iran be a part of any collective reduction in OPEC oil output. There is also marketplace uncertainty regarding the December 4 Italian referendum on constitutional reforms. A "no" vote on the reforms could eventually put Italy in violation of European Union rules. In other overnight news, the Euro zone got an improved report on consumer confidence Tuesday. The November reading on consumer confidence was -6.1 versus -8.0 in October. The other key "outside market" on Tuesday sees the U.S. dollar index trading slightly lower after recent solid gains that last week pushed the index to a 13-year high. U.S. economic data due for release Tuesday includes the weekly Goldman Sachs and Johnson Redbook retail sales reports, the third-quarter gross domestic product report, and the S&P-Case Shiller home price index.